by Brown, Catana; Stoffel, Virginia, Ph.D.; Munoz, Jaime Phillip, Ph.D.
"This is a text we have all been waiting for.I can't help but think that our earlier leaders in mental health-Dr. Adolph Meyer, Dr. William Dutton, and Eleanor Clark Slagle, to name a few-who knew the power of occupation and stressed the importance of engagement in an enabling environment, would be pleased to see this work come to a format that would guide clinicians to make a difference in the everyday lives of people with mental challenges that require the skills of an occupational therapist. 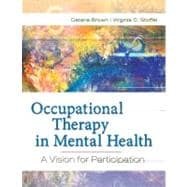 "-Carolyn M. Baum, PhD, OTR/L,FAOTA Past President American Occupational Therapy Association (2004 to 2007) from the Foreword This Client-centered, recovery-oriented text gives voice to the lived experience of mental illness across the life span. You will be guided through the assessment and interventions of individuals with mental health conditions and those whose life circumstances generate significant challenges to their participation in valued activities.